What’s the easiest way to reduce your water footprint? Think toilet water. Flush toilets aren’t new; the first patent for a flushing toilet was issued to Alexander Cummings in 1775. Every home has one (or more), and it’s something we simply can’t live without. Yet with all the talk about water conservation, the toilet is probably the most overlooked way of starting up your in home conservation plan. The truth is toilets are water hogs. On average a toilet will use around 18.5 gallons of water each day. That’s more than showers, faucets, appliances and leaks combined on an average day. 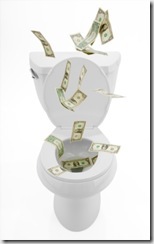 Over the years, toilets have come down in the amount of gallons needed per flush. Prior to 1994, toilets used approximately 5 gallons per flush, sending the average family of four’s toilet water usage up to 300-400 gallons per day. After 1994, the National Energy Policy Act of 1992 went in effect for all residential toilets, setting the upper limit of a single flush at 1.6 gallons of water. If you still have an old toilet using up to 5 gallons per flush, replace it immediately. Water rebate programs are still in effect throughout Colorado, which gives you a $125 rebate for replacing your toilet with an energy efficient model. Many new toilet models have reduced water usage down to 1.1 gallons per flush and lower. The newest models offer dual flush systems, which allows you to choose the water level needed for a flush. By simply replacing your home toilets, the amount of water savings can add up into the thousands of gallons per year. Which can also help you save about $100 or more a year in costs as well. While toilet water isn’t going to be the cure-all for our water conservation problems, it is a step in the right direction.